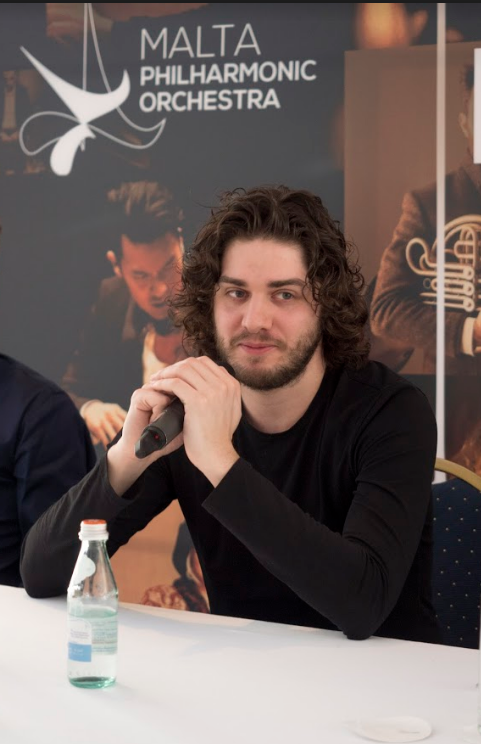 Tuesday’s meeting with the press was honoured by the presence of Georgian composer Giya Kancheli to whom the evening’s concert is dedicated. Born in Georgia Kancheli now lives in Amsterdam. His long career as a composer has passed through two basic phases: a time when under the Soviet regime his music was restricted and hardly known in the West, and the post- glasnost era when he found his place as one of the most distinguished living composers attracting increasingly frequent performances in Europe and America and commissions by leading performers including Dennis Russell Davies, Jansug Kakhidze, Gidon Kremer, Mstislav Rostropovich and the Kronos Quartet. 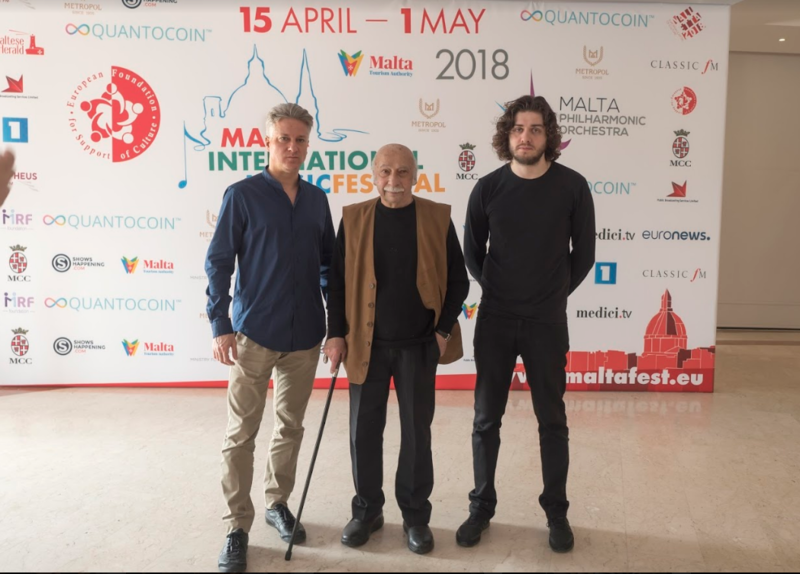 Alan Chircop, artistic director of the Foundation for the Promotion of Culture, the organizers of the current Malta International Music Festival opened the conference by thanking Mro Kancheli for his presence in Malta and for his presence at today’s press briefing. He asked the composer to explain his statement that “music is a mirror of life” that gave the name to today’s concert. In answer Mro Kancheli, who is noted for his sense of humour, related a comic incident that happened to him some years back when he was in Israel to receive an award and was talking to Shimon Peres. Also present were the two soloists taking part in the evening concert, Italian violinist Andrea Cortesi and Georgian violist Giorgi Zagareli. Cortesi first came across the music of Kancheli through a recording of his work Time… and Again for violin and piano written in 1997. This work, he said, he could not understand at first because of its slow tempo, its long notes and its pauses. In fact Kancheli’s scores teem with pauses which, he feels “precede the music that follows”. Eventually he learned how to listen to the music and found out that he was already connected with its sensitivity and that was the kind of music that he liked. For him reading music is like reading a book and he discovered early on that he had to learn how to listen as well as how to perform. Music is a unique kind of language, a medium for communication – a three-way dialogue between the composer, the performer and the listener. The music of Kancheli is a special opportunity to see what lies beneath the surface of the notes, for music is not just the notes but what the performer does to bring to life the notes written by the composer and transmit it to the listener. 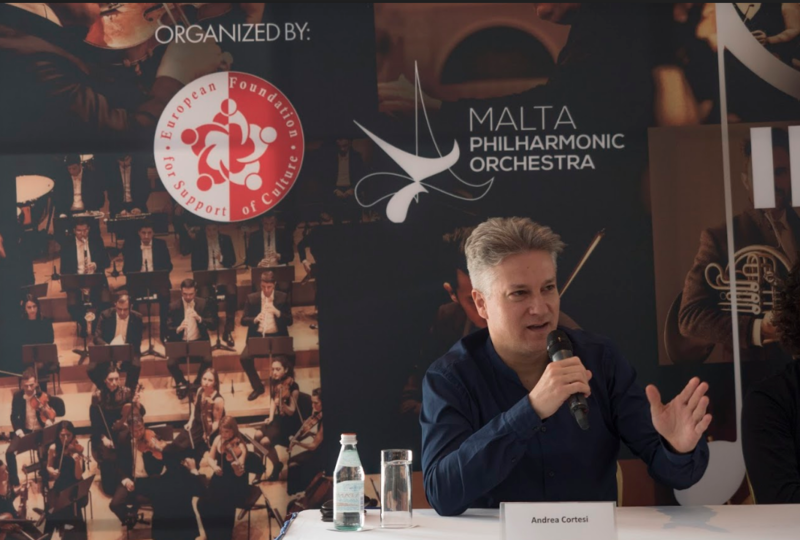 Viola player Gjorgi Zagareli said that this was a special year for him. He thanked the State Orchestra of Armenia and Mro Smbatyan for making this even more special for him. The orchestra members are young and full of energy and enthusiasm which they pass on to the soloist. Like Cortesi he feels that it is very important to feel the atmosphere of the long notes in Kancheli’s music. Asked about the nature of the two works that were being performed that evening Kancheli said that it was important for the audience to understand that the circumstances of their composition were different and therefore they are in two completely different genres. Letters to a Friend for viola and orchestra was composed for film and theatre and therefore was subject to the impositions of the characters and the plot. On the other hand ChiaroScuro was composed for himself and therefore reflects his character and musical style better. Asked in what way his musical language has developed over the years Kancheli said that at some stages in his life when he heard the music of Stravinsky, Bach and Schnittke he actually stopped composing: some events change one’s mentality, he said, the way one looks at life and this has an effect on the way one expresses himself. Eventually however, over time, he got a new energy and found himself composing from morning to night. Asked whether there was one particular work that he felt represented him more than any other Kancheli said that it was impossible to choose any piece that represented him: they were all him. He thanked the organisers of the Festival for dedicating the concert to his music and he also thanked the Armenia that last year had dedicated a two-day festival to him. Finally Alan Chircop asked Mro Kancheli what message he would like to leave to young composers today. Kancheli replied that if all the religious and political fanaticism continued to increase there would be little place for music and people will not want to listen to music. On the other hand he believes that strong personalities like those of Sibelius, Puccini, Schoenberg and Ravel will continue to emerge. Luckily music is the most abstract of all the arts. At present music is following many different directions and there is place for all of them to exist side by side. Closing the morning’s session Alan Chircop once again thanked the maestro for being present and for having provided the opportunity to have two outstanding soloists speak about his music.